Episode Spotlight: Quo Vadis, Captain Chandler? Capsule Summary: Sidney Freedman and Colonel Flagg arrive at the 4077th with different ideas about treating a patient who insists his name is Jesus Christ. There’s no denying that “Quo Vadis, Captain Chandler?” is a solid episode, perhaps even a great episode. In my mind, that’s because of the interaction between Sidney Freedman and Captain Flagg. Allan Arbus and Edward Winter played off one another wonderfully. It’s a shame their characters never crossed paths again. That said, Flagg doesn’t really do much other than act like Flagg. Likewise, Margaret and Frank are little more than plot points, getting outraged, demanding Colonel Potter do something about the blasphemous and cowardly patient masquerading as Jesus Christ, then calling in Flagg. Perhaps those involved felt the religious aspect of the episode needed to be balanced by something ridiculous. Personally, as much as I enjoy Sidney and Flagg together, I wish Father Mulcahy had more of a role in the episode. We get a brief scene of him discussing theology with Captain Chandler and that’s about it. What does he think about Chandler calling himself Jesus? Also, I have what may be a very unpopular opinion about the end of the episode: Radar asking Captain Chandler to bless his teddy bear is awkward bordering on painful to watch, not touching and meaningful. Larry Gelbart expressed regrets about introducing Radar’s teddy bear and I completely agree with him. In this scene in particular, the teddy bear doesn’t humanize Radar, it infantilizes him. Why not have Radar ask Captain Chandler to bless one of his animals? That would serve the same purpose without making Radar seem immature and childish. Klinger dressed up as Moses is hilarious. Too bad Hawkeye didn’t make a joke about Klinger only carrying one tablet with three of the Ten Commandments on it. Colonel Flagg and Sidney Freedman match wits. This is one of only a handful of M*A*S*H episodes not to feature a laugh track. Others include “O.R.” (Season 3) and “The Bus” (Season 4). When Sidney Freedman and Colonel Flagg meet, Flagg mentions the two played poker once. 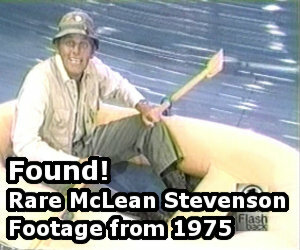 Most fans consider this a reference to the Season 2 episode “Deal Me Out” in which Sidney played poker with a Captain Halloran, played by Edward Winter and confirmation that Halloran was one of Flagg’s aliases. That fits within the context of the show but in reality, Halloran was Halloran–only later was the character of Colonel Flagg created. Radar gets a first name in this episode: Walter. There’s a lot about this episode that I can comment on. . . .
For starters, this episode is proof of what a solid and engaging series M*A*S*H is as a whole: as a rare breed of self-proclaimed “Laugh Track Nerds,” I appreciate a good and well-done laugh track on a sitcom, and I’m usually able to tell whether a laugh track is being under-utilized or omitted altogether (like “O.R.” for example) . . . however, I actually never realized a laugh track was excluded from this episode altogether until somebody pointed it out, because I was more engaged in the story itself to even notice. There’s a theory out there that this episode excluded the laugh track because of a concern that hearing people laughing at a delusional bomber pilot convinced he’s Jesus Christ would be disrespectful and blasphemous. I can understand that. But I don’t understand why a laugh track is absent from “The Bus,” as that episode has a lot of good zingers and humorous moments. Gary Burghoff has said this is his favorite episode, mainly because it was the one where Radar finally got a real name (Walter), but I’m also suspecting the subject matter was interesting to him, considering he himself was getting into religion around the time of this episode, and became a Christian by the time he left M*A*S*H.
One thing I found interesting about this episode too is this: B.J. apparently knew who Sidney and Flagg were, but Potter didn’t. The only explanation I can think of is during their downtime prior to this episode, Hawkeye could have shared some previous experiences with Beej, and thus, he became familiar with Sidney and Flagg based on Hawk’s anecdotes. And yes, I’m going to say that Halloran being one of Flagg’s aliases is fanon (not canon), lol. I too agree that it’s great seeing Flagg and Sidney in the same episode and it’s really too bad that never happens again. I had never noticed it but after watching it again, I agree with BDOR that BJ does appear to know who Sidney and Flagg are, and Potter clearly doesn’t. I guess it’s possible that they both visited in the short period between BJ arriving and Potter arriving, and with the goofy timeline, we don’t really know how long that was. Likely just an oversight of the writers though. Never minded Radar getting his Teddy bear blessed that much. Maybe it does kind of infantize him a bit, but that bear is his little peice of Iowa that he has with him over there and something that makes he cherishes and cares about. What’s more dumb to me is that Radar believes the soldier might be Jesus, but that’s just part of his characters naivety. BJ: How many two-year-old Pontius Pilates do you meet? Hawkeye: You wake up, brush your teeth, walk the dog, operate on the Lord. Both funny lines from a unexpectedly mind-expanding episode. Is there any evidence that the name Chandler is an absolute reference to “candle maker,” making the Jesus character a light to the world? And Radar is obviously using the teddy bear as a stand-in for himself…I actually love that scene, the writing, and Burghoff’s starry eyed, not quite sure acting. First I want to say that I love this site and am grateful for having found it. Keep up the good work! You know I never throught about Radar and the Teddy Bear. I thought it was poignant, but yes, it does kind of infantalize him and the suggestion about using one of his animals, like his raccoon for example would have made sense. I agree also that more byplay with Father Mulcahy would’ve been great. In fact, why not make this a two-part episode since there was so much to it, too much for a 1/2 hour script? I actually hated Margaret and Frank blowing the whistle on this one. I guess you can expect it from Frank, but Margaret, well she could be a shnook, but she always had compassion for patients, especially ones who had been traumatized and do not believe she would ever have been a party to that. In fact I think Margaret would’ve told Frank to forget it and he would’ve done it anyways. Truthfully, I thought this was beneath even Frank. 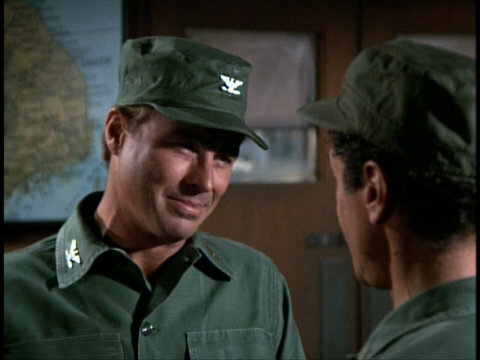 On a side note, the episode I think Frank and perhaps Margaret could’ve gotten in on was the one with Soon Tek-Oh as the North Korean surgeon whom they did not trust – that would’ve been a story where Flagg could’ve been added, but I suspect they were trying to keep it serious and Flagg would’ve interfered with that. To return to Flagg and the episode, actually I think while Flagg is always funny, this was a serious episode and there is a part of me that felt that Flagg being summoned kind of was incongruous with the rest of it. Anyways, those are my thooughts. This is one of my favorite post Black-Trapper episodes. It depicts how war may not kill you, but it steals your innocence and previous identity. Hawkeye loses his sharp sanity. BJ becomes disillusioned. Radar loses his innocence. The final scene is one of the more poignant of the series. Radar asks Chandler to “bless” his Teddy Bear. Chandler obliges. But then, Chandler “blesses” Radar, to which Radar reveals his real name. In 20 seconds, Radar loses his childhood innocence and starts to become a man. The final shot shows Chandler boarding the bus. While Hawkeye and BJ watch in the foreground, Radar is glaring in the background, unsure of what he just experienced. In fact, they’re all unsure what they just experienced. Maybe it was a religious kind of experience after all? What also makes that final scene haunting is the music. It’s that kind of melancholy music that makes appearances in the early seasons (“Kim,” “The Nurses,” and “The Consultant” come to mind). For some reason, that music was never used again from Season 6 to the end. Flagg: When can I have him? Give me a decision now! The last CO they had here couldn’t make a decision without a month’s notice! Potter: I’m not fond of personal abuse, Colonel! I was in this man’s Army when the only thumb you cared about was the one in your mouth! I tend to agree with how Radar is treated in this episode by having Chandler bless his teddy bear. The bear to me always symbolized innocence and the desire to stay connected to home. When Radar has him bless the bear it makes Radar go from innocent farm boy to a childlike figure. That being said, it was genius figuring out a way to get Flagg and Sydney together. They were incredible in their roles and incredible together. The teddy bear scene…there are other moments when the bear seems to infantilize Radar (in one episode he and Klinger are arguing and Radar says, like a little kid, “You’re hurting him!”) but here I think is where he starts to outgrow it. Chandler himself is properly enigmatic and sympathetic as a man who’s either lost his sanity or maybe found a new calling in life once he got it back. I enjoy this episode, particularly because I am a professing Christian. I wish they had confirmation that Chandler was Christ or not. In my mind, he was. I wish they’d focused on Mulcahy’s conversation with him more, sort of like in one of my favorite films, “Dinner With the Perfect Stranger”. I wish the show ended like this: before Chandler left, Mulcahy conforted him, saying, “Tell me: who are you, really?”, and Chandler would look at him and say, ” Who do you say that I AM, Francis?” Mulcahy would think that sounded familiar, so he’d look in his Bible and find the verse where Peter asked Jesus who He is and Jesus replies, “Who do you say that I AM?” Then Mulcahy would look up to Heaven and quote the answer Peter gave to Jesus: ” You are the Christ, the Son of the Living God”. Cue end credits. P.S. I love seeing Dr. Freeman verses Colonel Flagg. The part where Freeman calls Flagg “a walking bag of fertilizer” gets me laughing every time! Hey, Guys, it’s JocularityGirl again. I just felt like I needed to apologize for the P.S. part of my last comment. I started offf talking about Jesus, trying to be a witness, yet tacked on a thoughtless comment. I sometimes forget that T.V. show, even comedies. are supposedly “real-life” situations, according to the characters, and in reality, I would never condone such a comment being said about or to anyone, no matter what. I sometimes forget that Jesus commands us to love our enemies and bless those who persecute us (Matt.5:44), and that even goes for the Frank Burnses and the Colonel Flaggs in our real lives. I’m not perfect, and when I’m wrong, I try to realize that and apologize. Praise be to Jesus that He has dies for us all, and that we are forgiven in him. Again, I’d like to apologize for that comment. If there is someone here struggling with guilt, here is a verse that helped me: “For if our hearts condemn us, God is greater than our hearts, and knows all things”. If God forgives us, who are we to not forgive ourselves? Thank you, Phil! You, too! Wonder if Mike Farrell was supposed to laugh at Flagg’s “You’re not smart, you’re dumb but you’ve met your match in me.” It seems like a blooper and they rationalized BJ WOULD find that funny, leave it in. Being a Christian, I love this episode as it challenges us to consider the possibility of Who and What we expect Christ to be and would we be willing to believe He walks amongst us. I LOVE the scene with Radar as he is offering the teddy bear to be blessed, as an offering of his faith, which Christians know have a biblical symbolism of offerings as blessings. His response in revealing his real name is his laying bare (no pun intended) the piece of him that he considers his I Am and having that affirmed by the Great I Am. And then he is blessed in the process. His awe of the possibility that he has just been blessed by the symbol of his faith again challenges those of us who do believe, what would be your response if you thought you were face to face with Christ? Is there any protocol to that? The episode did not answer any questions as to yes or no, but left that to the faith and possibility of ‘what if…’ to the viewer. So who is to say Radar’s response is infantile or not. If the Pope blesses someone it is a sacred moment. But that is because the world has acknowledged ‘this is the Pope’ so the world has approved him as a man of faith. But Jesus was not a man of proclaim and was condemned for not being approved by the world. This episode raised the scenario that we know not the time nor place. It raised some highly theological consideration points. Truly an episode worthy of a biblical class discussion.